ice fall had consumed. Whew. 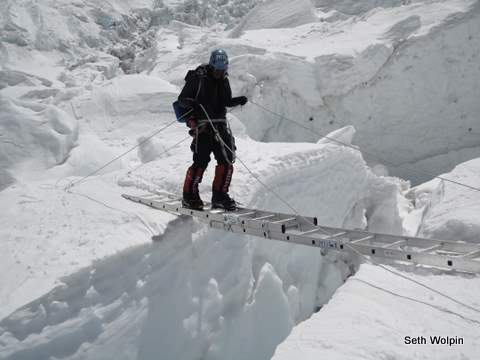 between the rungs and did not look down into the depths of the crevasse. clipping in with their personal anchor. A little unnerving to watch. the South Summit, and the summit of Everest itself. Simply amazing. In total, I think ~6 tents wended up being shredded by the wind. could work on getting things set up more. going stir-crazy after a couple hours. Why didn’t I bring my kindle up? it credit for…it was a long night. going was much faster without them. Our tent at Camp I was barely intact, one side was completely indented. I thought the poles were broken but they apparently have a lot of flex. bomb-proof Mtn Hardware dome (thanks!) before heading down. not try to go through the ice fall when the sun was on it..dangerous! because everything around (including under) you can move at any time. But other than a small avalanche in the distance though – nothing moved. camp, but it still took another 30-45 minutes before I was ‘home’. ← Update from Camp II! Kelly, where is 75 degrees?! Seth, ladder photos are not trite to me so I really appreciate seeing it. Also, all the details in your log are making it possible for us to “be there.” Also glad to hear you have a reasonable amount of caution!